It's so hot today (39c or 102f) - a perfect day to stay inside and sew. I did just that, and completed the next Farmers Wife block. Once again I used my 1" thangles - they really make small HST's easy. 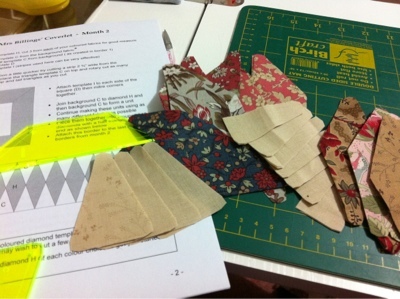 And even though the block in the book is made up of only two fabrics, I've been trying wherever I can to use all four. 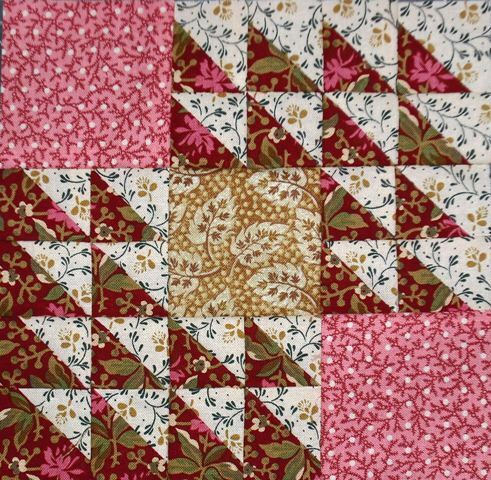 I did some calculations - now that I've made 27 blocks - once I'm 3/4 the way through piecing the next block, I will have sewn one quarter of the total number of blocks! Yay! This machine is in wonderful condition and comes with a box, manual and an assortment of accessories. It has lovely gold work, and if memory serves me correctly, it's from 1949 (and it's 220-240v). First of all though, Marty is going to go over it completely and make sure it's electrically sound and ready to sew. While I made sure it ran when I purchased it, I have never actually sewn with it. So, if you're in the market, give me a little time, and it could be yours! 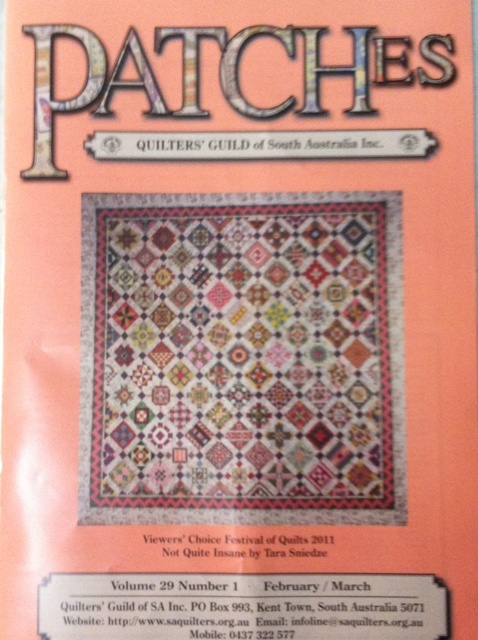 The Quilters Guild of South Australia asked me to demonstrate machine pieced FWS blocks at the meeting in March (which is Thurs next week) so I thought I'd better re-acquaint myself with the project. Why have I stayed away so long?? 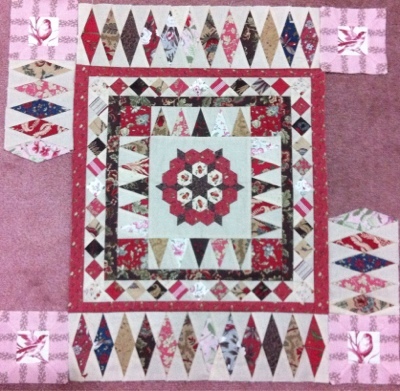 This block was really fun to make - and I used the 1" thangles that I picked up while I was in the USA. And speaking of the USA: I can't believe how few pictures I took while I was away this time. But I'll share some of what I have anyway. I probably didn't spend as much as I could have, but I still managed to get a stack of fabric together! It was definitely worth checking out. Thank you for the heads-up Bonnie! And because we were close by, I really wanted to visit Disney again - after all, it's the happiest place on earth! On the Sunday we spent the day at California Adventure, and while we were waiting to watch World of Colour, I got this pic of Mickey's Ferris Wheel. I just love the colours. The World of Colour show was mesmerising, I enjoyed it so much. 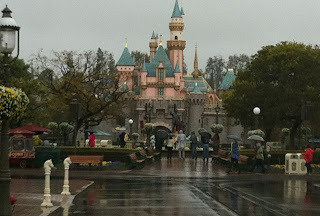 And on Monday we visited Disneyland - I just love that place more than I can even describe! It was a wet morning, which we didn't really mind at all. And because of the weather, the park was really quiet. It fined up in the afternoon though, and we just had the best day - we were able to get on all the rides with virtually no wait. I have never before been able to do some much in one day at Disney. My kids would have loved it! After our adventure, we went back to Linda's beach house for her quilt group retreat. I shared pictures of that while we were there. In between all this, we shopped and shopped, and shopped some more! 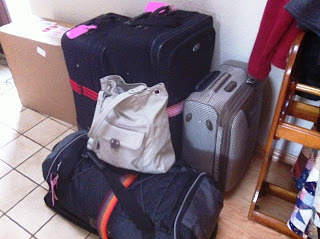 And here is my pile of bags once I was all packed and ready to come home. I can't believe I managed to buy so much! Three suitcases, a rolling carry on crammed full, and I can't even imagine how much my handbag weighed. But it all made it home relatively unscathed, and I still haven't found spaces in my sewing room for everything. The next border is going to take some time to piece - it's another with those little squares that are around 1" in size, and when the next framing border is in place, I can move onto the third installment. I'm sure I'm due to get the fifth in the mail soon - so I'm only three months behind *lol*. Claudia asked after the Noah and Friends project I shared a little while back. I'm sad to say you probably won't be seeing that one again. 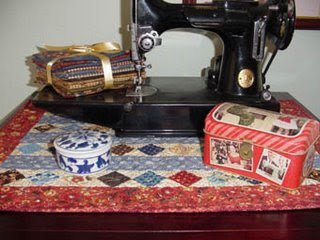 I was repairing the project for a lovely customer of mine, and now that the top is complete I've handed it back to her. She has some blanket stitch work to do, and then she will decide what she's doing about quilting. It was just adorable though, and fun to work on. Quilter Steph asked after the hexagon tool I was using to cut out the hexies before I went away. It is a sweet little template that was supplied with the Mrs Billings Coverlet block 1. I have seen other hexagons like it before - it's basically a template that has the middle cut away so that you can trace the sewing line and the cutting line. Very cute. 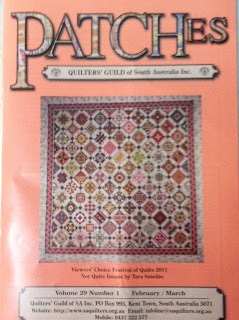 I suspect that Somerset Patchwork and Quilting had the templates made especially. Hope this helps. Alrighty, I think this has me somewhat up to date with my emails - I hope I don't get too far behind again in a hurry! In my next post I hope to share a few more USA pics ... chatter soon! Just made a flying visit to Hettie's Patch and found some things that had to come home with me! 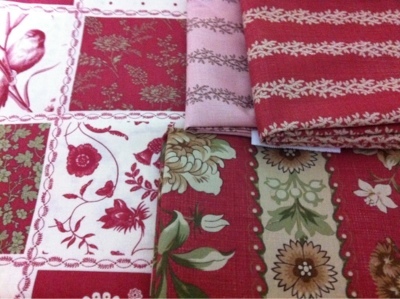 These lovely fabrics are going to look wonderful in my Mrs Billings Coverlet project. Yum! 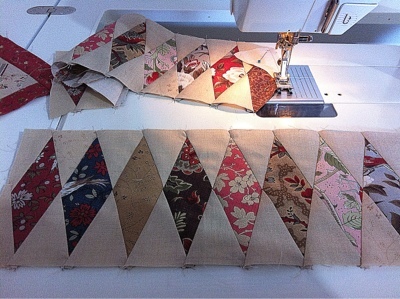 I love the precision piecing that's required for this project. All the careful cutting and pinning is time consuming, but really worth it. I don't seem to have it in me right now to sit down and write a huge post about my trip, so I'll take it in small bites and post little bits and pieces over a little while. In the class I got the blocks almost entirely finished, and then put the top together while were on retreat at Linda's beach house. A big shout out to the baggage handler that gave the bag this beauty was in such a terrible beating, but luckily for me everything made it home relatively unscathed. I realised afterwards that I should have put it in fragile freight - but I guess that's by-the-bye now. I SHOULD be preparing a newsy post for you about my wonderful trip to the USA, and instead I find myself consumed with the second installment of Mrs Billings coverlet. Got this in the mail today, what a nice surprise!